Funny story about new-to-me food #39. The story starts back in December with a foreign stranger and involves me showing up uninvited to a gathering for Canadians only. But I'm ahead of myself. There is a Facebook group for Craft and Hobby Association members. It is very active leading up to the big CHA Mega Show in January. I saw a post from someone I didn't know named Roberta, who asked if anyone wanted her to bring them food from Canada that you can't get in the US. Do I? Are you kidding me?!? YES! We became Facebook friends and sent messages back and forth, with plans to meet up during the show. But by the 5th day of the show, we still hadn't managed to coordinate our schedules. At this point, I was NOT going to leave without meeting her and taking a Canadian food that she'd schlepped all the way to Anaheim. So I showed up, uninvited and unexpected, at the meeting of the CHA Canada Members, hoping to find her there. Success! Roberta was busy (it was a meeting, after all), so I chatted with the various people who were milling around the food. They all thought it was hilarious that an American had crashed their meeting and assured me I was welcome. Canadians are famous for their politeness for a reason! They named me an Honourary Canadian (complete with the U). Thanks, guys! I finally got the chance to meet Roberta in person. She gave me some Coffee Crisp candy bars before we each had to run off to classes. 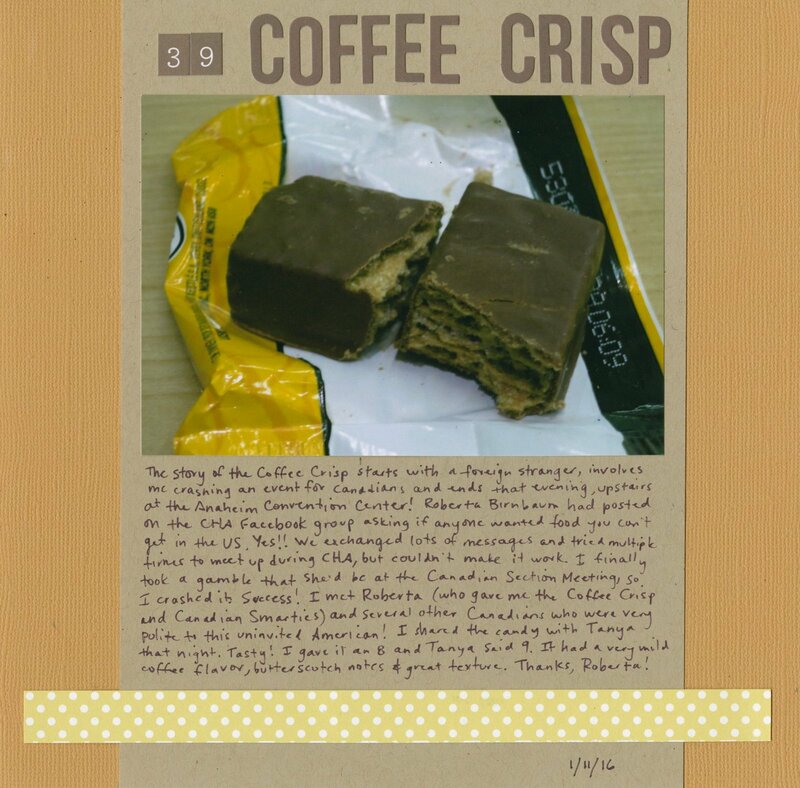 That evening, when Tanya and I met to debrief, I pulled out the Coffee Crisp and split it with her. I'm not sure why I didn't get that this is coffee-flavored. For some reason, I had it in my mind that it was to eat with coffee (like coffee cake) rather than flavored with coffee. As it turns out, the coffee flavor is very mild and has a delightful butterscotch note going on. The candy was crisp and sweet and yum. Tanya gave it a 9 and I gave it an 8. Thanks again, Roberta! Funny story! And I love COFFEE flavored - anything! This was a fun story! Hope I can get my hands on it again someday. You Canadian party crasher!! LOL!! I love that story and loving the page!!! Gorgeous!!!!!!!!!!!!!! I am a huge fan of coffee flavored anything, so I'd have gate crashed too! LOL This is such a fun story! I didn't know what I'd be getting before gate-crashing! She brought a variety of sweet and savory Canadian snacks and this is what she gave me.